HIGHGATE: Police responded to Darlene Drive on Saturday for the report of a body that was found in a wooded area about 150 feet from the roadway. 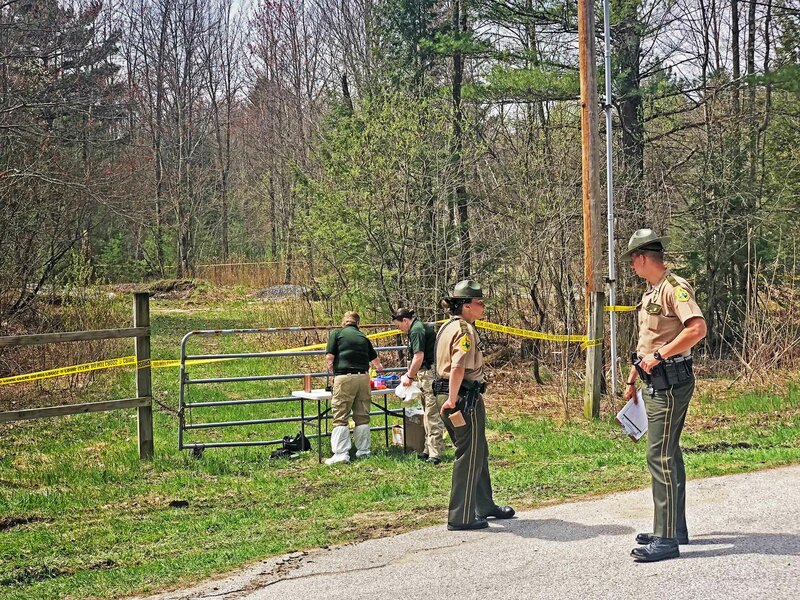 According to Vermont State Police spokesperson Adam Silverman, Troopers were called to the area after a nearby resident was walking their dogs and found the body. Few details were available to the public on Sunday afternoon while the Vermont State Police Crime Scene Search Team was scouring the area, looking for evidence. An area about one acre was cordoned off with yellow police tape with a smaller area about 100 square feet cordoned off with orange marker tape, presumably where the remains are. Law enforcement indicated the remains had been dumped at the scene for an extended period of time, but would not narrow that timeframe down, only indicating that the body had likely spent some of the winter where it was found. The officers could be seen using a metal detector and unpacking a sifter. The location was an only recreation area where a small baseball field and basketball court had grown into an unkempt wooded area. State’s Attorney Jim Hughes spent about two hours on the scene on Sunday afternoon with law enforcement officers. No charges have been filed and no suspects have been identified in connection with the death. The roadway remained open as police investigated the scene, allowing those who live in the area to get to and from their homes on the dead-end road. The County Courier will work to find out more information and report it here when it becomes available.